Global Outdoor Furniture Market size was valued at over USD 16 billion in 2017 and is anticipated to witness over 5% CAGR from 2018 to 2024. 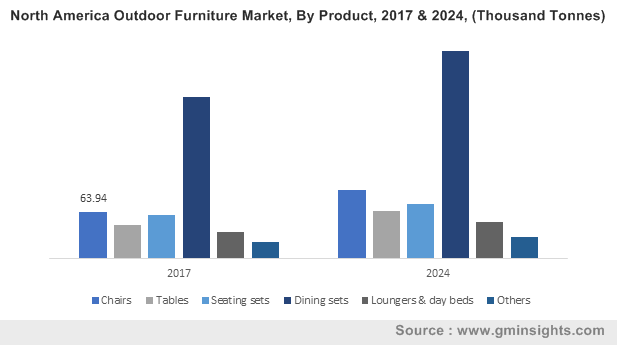 A substantial shift in the construction industry, accompanied by improved consumer spending on home improvement will positively influence the outdoor furniture market growth. Rapid socializing trends, including dining at gardens, rooftop restaurants, grilling & barbeque events in the garden, or in the backyard area are the factors propelling the product demand. The growing preference for free space in front yard & backyard lawns, garden, or artificial indoor gardens with architectural designs are key factors enhancing the garden aesthetics demand. In North America and European countries, people have a strong attachment for old-style houses with outdoor gardens and lawns, which in turn instigate demand in the western countries. The upsurge in the disposable incomes and costumer traveling trends is propelling the travel and tourism sector across the world which in turn will augment the outdoor furniture market growth. Surging tourist trends majorly in the coastal areas, hill stations, and rich cultural & historical heritage destinations will propel the industry landscape. Decorative lounge chairs, upholstery products, and table are among the key products, providing a strong outlook for the substantial revenue generation in the overall business. Increasing consumer attention toward enhancing outdoor spaces to create comfortable and appealing designs of the garden, the balcony, outside porches is influencing market growth. Consumers are willing to spend their disposable income, especially for the make and design of outside furniture products for increasing the aesthetics, which will boost the product portfolio. Changing climatic conditions of various countries directly impact the demand for outside furniture products. Upliftment in the consumer living standards owing to the rapid urbanization in the developing countries such as South Africa, China, and India will stimulate the outdoor furniture market growth. Also, expansion in commercial sectors including hospitality, educational institutions, and offices is stimulating the outdoor furniture market growth in developing regions. The rising demand for premium hotels owing to increased tourism & consumer spending globally will proliferate the market expansion in touristic countries. Government norms and regulations pertaining to the improvisation of furniture product usage will standardize the industry. For instance, The British Contract Furnishing Association (BCFA) stated the importance of complying with fire safety standards for upholstered outdoor furniture. These safety amendments for precautionary measures are essential in summer for outdoor furniture including, sofa sets, dining, and chairs. Fabric, foam, and other cover materials shall meet the BS 7176:2007 fire safety standards. Wood will surpass USD 12 billion revenue by 2024. Wooden furniture is among the most preferred material owing to its natural appearance and exceptionally attractive designs that influence the outdoor furniture product portfolio. Mahogany, redwood, teak, cedar, pine, eucalyptus, and composite materials widely used wood categories in the industry. Further coating with a wooden primer and varnishing enhances natural wooden finishing of the teak, redwood, and other raw woods. A wooden furniture is an expensive option owing to stringent regulations regarding wood cutting and deforestation in several regions. Textile material will witness over 5.5% gains during the forecast period. Fabrics are the key materials to improve the comfort and aesthetics of the furniture. PVC, acrylic fiber, olefin fiber, and polyester are widely used in product making. Modern designs including numerous patterns, bold color shades, textures, and designs enhance compatibility with an architectural theme for outer spaces. Acrylic is flexible and shows quick drying properties, boosting the material demand. The easy to clean benefits offers numerous applications to the commercial and residential sectors. Chairs are projected to observe over 6% gains up to 2024. Chairs can be simple wood based or it can be enhanced with waterproofing materials, textiles to make it more comfortable and give better appearance. Synthetic rattan, wood, metal, fabrics, and other textiles are among key used materials. These chairs are designed for the lawns, poolside, resorts, and gardens. Designers are installing different color combinations and shades with metal and wooden combinations, making a versatile product. Dining sets accounted for more than 45% volume share in 2017. Demand for dining sets are growing rapidly owing to its mandatory necessity in residential and commercial spaces including restaurants, resorts, and hotels. The availability of multiple designs of these products including seating capacities and types of materials used is supporting the segment growth. Industry participants are engaged in incorporating advanced technologies into their products for enhancing the overall product appeal. For instance, Linak offers a wide range of dining table sets with height adjustable capabilities by using batteries and actuators, further expanding the segment share over the study timeframe. Residential segment is projected to surpass USD 14 billion revenue in the forecast time period. Developed economies in Europe & North America hold a major potential in residential sector. The trend of family gatherings & dinners in residential gardens will stimulate the business development. Aging population, high disposable incomes, along with willingness to spend on luxury furniture are strongly supporting the outdoor furniture industry growth. Commercial sector will witness over 4.5% CAGR in terms of revenue up to 2024. Increasing consumer spending on travel and tourism trends have improved the count of travelers, tourists, and visitors supporting strong segment growth. Hotels with pool and garden, cafes, restaurants, and beaches are key potential areas for the market growth. The growing trends of open area in cafes and restaurants mainly in sea side areas are observing frequent consumer visits due to attractive view. North America market is anticipated to surpass USD 7 billion up to 2024. Increasing hospitality sector expansion coupled with growth in the outbound trips will influence the regional industry growth. The region witnessed more than 9% growth in outbound trips in 2017. North America witnessed more 4% growth in travel & tourism. Moreover, rising trend for offices with gardens and proliferation of recreational centers are further strengthening the product portfolio. Europe accounted for more than 26% revenue share in 2017. The region observed a strong demand for the Sun & Beach holiday, which is around 9%. Moreover, the overall growth of total outbound trips registered 4% growth. Germany, the UK, France, Italy, and Spain are primarily contributing to industry growth due to consistent demand for patio furniture in these countries. Traditional residential buildings along with the new constructions are boosting requirement for the outer furniture including chairs, table, lounges, and combination sets strongly supporting the industry growth. The outdoor furniture market share is extremely fragmented with a large presence of industry players in regional and global level. Key players include Ashley Industries, Inter IKEA Group, Century, Agio International Company Limited, Brown Jordan, Barbeques Galore, Keter Group, and Lloyd Flanders. Major companies are anticipated to develop their supply chain network to profit from being customer friendly to capture a larger industry share. Product design, assembling, and after-sale service is the key concerning areas for the market players. Other notable players include Dedon, Emu Group, Tuuci, Royal Botania, Hartman UK, Homecrest Outdoor Living, Kettal, Fischer Mobel GmbH, Treasure Garden Incorporated, and Gloster. Mergers & acquisitions will be a key strategy for industry players to enhance their market share over the forecast period. For instance, Tuuci LLC acquired Pavilion to expand its product portfolio and to increase its profitability. Additionally, industry players are constantly focusing on enhancing their production facilities and upgrading their solutions to differentiate their services from competitors. Outdoor furniture market varies significantly as per the material, product and end-use type. Surging financial ability to spend on leisure & experiences is propelling the product portfolio in the residential sector. Increasing count of manufacturers in the business along with portfolio extension by existing manufacturers will fuel the market demand growth. The expansion of distribution networks along with increasing brand advertisements online & offline are strongly supporting the industry size. Government bodies with their significant regulations and norms across the globe is improvising the product standards and quality in the overall market. The business includes a highly complex supply chain with multiple suppliers and vendors located at different geographic locations globally for countering the demand, maintaining product quality, improving gross margins, and smooth functioning of the business. The importance of raw material in achieving competitiveness in the upstream portion of the value chain is growing annually. A well-established supply chain network with minimal lead time is among the key considerations for enhancing the overall profitability. 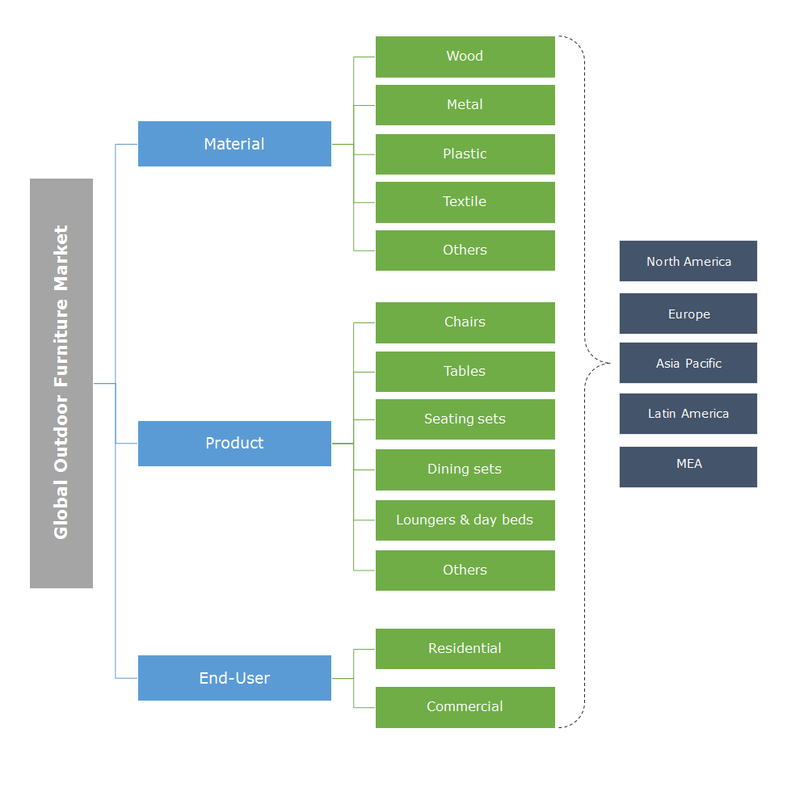 The parameters for supplier selection vary for each manufacturer. However, guidelines by the major furniture organizations for supplier selection are given high importance.